Obtaining funding to support basic research has always challenged scientists and entrepreneurs. However, in today’s tumultuous economic climate and looming sequester cuts, the future of life science funding is more uncertain than ever. Since San Diego has been rated among the top life science biotech regions in the US and is home to some of the world’s top research institutions, one of the things that San Diego can rely on is that we are great at innovation. So, how can we, as a community, ensure that this innovation is financially supported despite these circumstances? 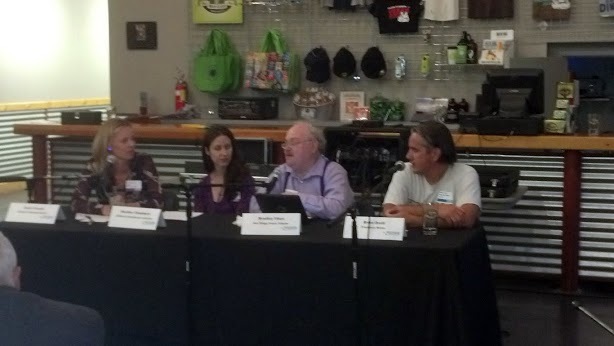 A panel of local science communication experts gathered to discuss these issues at SDBN’s April 29th Biotech Journalism Panel event. The panelists were Brad Fikes (San Diego Union Tribune), Heather Chambers (California Healthcare Institute), and Brian Orelli (Freelance Journalist). The panel was moderated by Carin Canale, Founder of Canale Communications and member of the Biocom board. Let’s face it, scientists have experiments to do and grants to prepare. Most don’t want to be bothered with the particulars of how and with whom to communicate their science, outside of their sphere. But what if there was evidence that effective science communication to the public actually impacted funding? This question started the panel discussion and we quickly focused our attention on San Diego’s own success story: stem cell research. It is clear that media coverage of the stellar stem cell research community helped put our city on the map in this field. Raising public awareness of the innovative science we were doing ultimately impacted funding decisions made in Congress, the NIH, and alternative funding sources, including the California Institute for Regenerative Medicine (CIRM). Within the last 5 years, San Diego has become the one of the premiere regions for stem cell research and works closely with CIRM which is bringing top-rate scientists, employment opportunities and funding into the region. Articles were written that appealed to a mass audience and were very broad. Hyperlinks were added to the articles if someone wanted to obtain more detailed information. The articles brought in the patient perspective. Disease-related basic research is relevant for patients and they’re very keen to find out the latest news. Blogs targeting the more engaged or educated consumer. 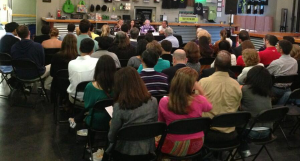 Photo courtesy Ramy Aziz, who Tweeted it during the event. To avoid being misinterpreted, talk slowly and restate what you’re saying or have the individual explain your story back to you. Treat interviews as a conversation; provide analogies; don’t just read from a polished abstract or press release. Explain why your work is unique from other research in your field. Hit the ‘high points’ not ‘all points’; Decide what are the most important elements of your story that you want to share. One great way to get your message out there is Twitter. Scientists tend to be risk-averse when they are experimenting with new models of scientific communication (they have enough experiments to do). However, we know that life scientists have used social media platforms such as Twitter, LinkedIn, and blogging, to obtain funding, find jobs, and build collaborations. The platform that has most recently gained a lot of momentum in the life science realm is Twitter. Twitter is an online networking tool that allows users to engage in a world-wide conversation by sharing text- based content—called tweets—of up to 140 characters. It is estimated that 3-5% of life scientists are currently using Twitter and this percentage is rapidly growing. Tweeting has evolved into a great resource where the dynamics have helped create an environment of positive scientific exchange. 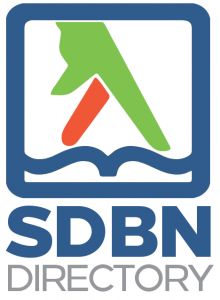 In fact, attendees at the SDBN event were tweeting and you can follow their virtual conversation here.